Members are encouraged to enter their quilts in each of these Fairs which we support through awards sponsored by the Guild. Entry Forms are available at the Petaluma Library. In addition, the Guild donates a $50 Best of Show Award in honor of our Life Member Joyce Gross, a world renowned quilt historian, to the Sonoma-Marin Fair and a $50 Machine Quilting Award in memory of past member, Dorie Whipple to the Sonoma County Fair. In May of each year, the Guild demonstrates hand quilting at Olompali Park Heritage Day in Novato. Members may volunteer to participate bringing their own work to use for the demonstration. In addition, members may volunteer to display the current Opportunity Quilt. 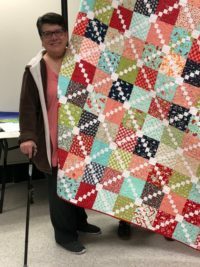 Each year, three Sonoma County Quilt Guilds, the Petaluma Quilt Guild, the Moonlight Quilters of Sonoma County and the Santa Rosa Quilt Guild participate in a luncheon. The three Guilds take turn hosting the afternoon which includes lunch, a speaker or program, and raffles. When it is our turn, members are asked to donate a dish for the luncheon, raffle items, sew blocks for a raffle quilt and decorate tables.